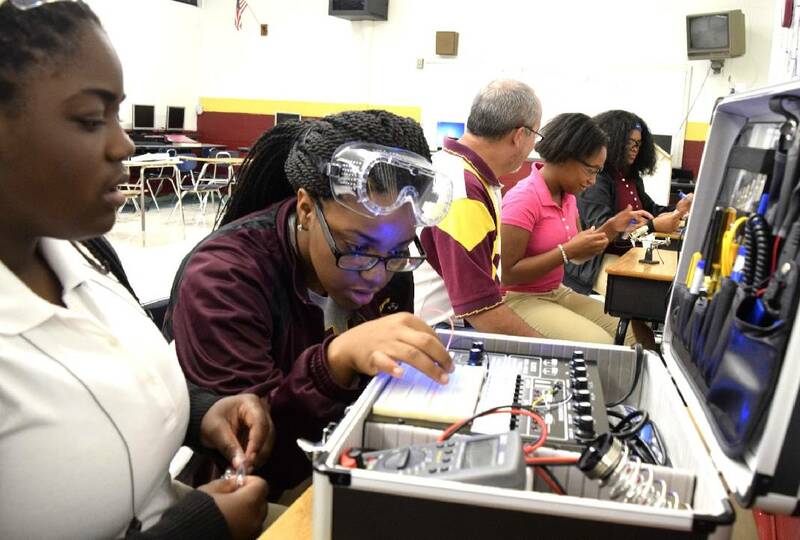 Tyner students (from left) Jada Beckett and Takayla Sanford work on buidling circuits on the digital analog trainer, while teacher Bryan Robinson instructs Brookeana Willams and Noemy Marberry about soldering. Tyner High teacher Bryan Robinson has started a mechatronics program that offers student the opportunity to graduate with a specific certification that will aid them in finding jobs with high-tech companies. 1. Davidson County employment grew 14.1 percent, adding 41,560 jobs. The Chattanooga area has yet to regain all of the jobs it lost during the Great Recession that began nearly eight years ago. But an influx of automotive suppliers and the growth in tech startups and existing businesses should push employment in metropolitan Chattanooga to a record high in 2016. A new study suggests that job growth in Hamilton County — already the second highest among Tennessee's counties in the past five years — will grow nearly four times faster in the next five years. The analysis of local job listings and business announcements estimates that Hamilton County will add 13,500 jobs from 2015 to 2020, up from the 3,573 jobs added in the county during the previous five years. "We have one of the best places in the country to live, work and play, and with the growth of Volkswagen and other businesses, we're seeing a real momentum in job growth, especially in family-wage jobs," said Bill Kilbride, president of the Chattanooga Area Chamber of Commerce, which helped commission the study. But Kilbride acknowledges that all that job growth is creating a growing challenge for businesses. Employers who enjoyed their pick of qualified workers during the economic downturn are now struggling to fill all of the new jobs coming on the market. And the job crunch is likely to intensify for employers as the economy improves and VW moves ahead with its plans to make another vehicle in Chattanooga. Employment in the 6-county metropolitan Chattanooga area is still about 3,000 jobs shy of the employment peak reached at the end of 2007 before the recession. And Chattanooga's metro jobless rate last month of 5.3 percent was still nearly 50 percent above the pre-recession low, according to the U.S. Bureau of Labor Statistics. But many employers report that filling vacant jobs is much harder than a decade ago. That's because the jobs that have come back after the 2009-2010 slowdown require higher skills, and many potential workers left out of the job market in the recession don't have the job skills needed for today's jobs. "I've been working in manufacturing for more than 30 years and this is probably as tough of a challenge for employers as I've ever seen," said Tim Spires, a former Olin Chemical manager who is now president of the Chattanooga-based Tennessee Association of Manufacturers. "Today's advanced manufacturing is clean, challenging and high paying, but it requires more technical skills than factories used to require. As Baby Boomers age and retire and more jobs open up, the available pool of workers that employers can tap is not as great, and the skill demands are much higher." Spires said the skill and labor shortage is the biggest problem today for Tennessee manufacturers and, unless addressed, could curb the pace of economic growth in the Volunteer State. Most of the new manufacturing jobs don't require a 4-year college degree. But they do require a certified level of technical training in machinery, welding, maintenance or other skills. Such certificates require anywhere from a 12-week commercial driving course or computer programming certification to a 2-year associate's degree. To fill the new jobs, Tyner High School has added a mechatronics training program funded, in part, by Gestamp, which is expanding its Chattanooga operation and adding another 510 jobs. Graduates of the engineering and technology programs at Chattanooga State Community College are being recruited by multiple employers wanting their skills — both those with 2-year degrees or those with quicker-to-earn industry certificates. "They are being highly courted — there are probably three employers trying to hire for every one of our graduates, right now," said Lulu Copeland, Chattanooga State's interim executive director of workforce development. "In a lot of our high-demand jobs like information technology, welding, mechatronics or truck driving, we have employers talking with and trying to hire our students even before they are finished with their classes." Jared Bigham, a former Polk County high school principal and director of college and career readiness for the State Collaborative on Reforming Education, is coordinating a new initiative trying to help local public schools better prepare graduates for the new jobs in Hamilton County. "It's not just Volkswagen or other advanced manufacturers who need these skills," he said. "Almost every employer we talk with is in need of workers who have both the hard and soft skills to perform the jobs that are being added in our area." Bigham said a study of the jobs listed by local employers found that 83 percent require some type of certificate or degree. But only about a third of Hamilton County's students are getting that level of training within six years of graduating from high school. Without such training, many workers are simply not qualified for the higher-paying jobs that are opening in up Chattanooga. "The challenge for us at this point of the business cycle — and going on into the future — is finding the quality of workers that employers demand," said Dr. William Fox, director of the Center for Business and Economic Research at the University of Tennessee. "This is exactly what Tennessee Promise is designed to help address (with the offer of two years of free community college for any eligible high school graduate). For Tennessee to be able to continue to attract new businesses we have to develop our labor force." Fox estimates that the addition of the Sports Utility Vehicle line at the VW plant in Chattanooga, which is projected to add 2,000 VW jobs at the plant, will create another 8,000 spinoff jobs from automotive suppliers and businesses that supply the needs of VW, their suppliers and their workers. "Automotive plants have some of the biggest economic multipliers," Fox said. "But 21st century manufacturing requires higher skills for workers in these plants." In addition to the growth in the automotive sector, Fox said the overall economy is growing at a fairly steady 2 to 2.5 percent pace, adding other jobs across the economic sector. In Chattanooga, the city is touting its new Innovation District to try to lure and nurture more technology startups. But workers in those jobs usually require coding and IT skills. "The challenge for Tennessee is to make sure we have the workers trained for the jobs that are coming," Fox said. Contact Dave Flessner at dflessner@timesfree press.com or at 757-6340.